On 14 July CVGHM reported that, since the Alert Level for Kaba was raised on 20 October 2009, seismicity had fluctuated but decreased overall. During September 2009-May 2011, when weather permitted, white plumes were seen rising 25-300 m above the crater rim, and during June-July 2011 diffuse white plumes rose 50 m above the crater rim. The Alert Level was lowered to 1 (on a scale of 1-4) on 12 July. Deep volcanic earthquakes, seismic tremor, and five small explosions with corresponding ash emission were reported from Kaba in August 2000 (BGVN 25:11). Since then, Kaba has been quiet, but even in its normal state it almost always emits whitish plumes 25-100 m high. On 20 October 2009, the Center of Volcanology and Geological Hazard Mitigation (CVGHM) reported that seismic activity from Kaba increased in August and remained elevated into September and October. Inflation was also detected. When weather permitted, diffuse white plumes were seen rising ~ 25-50 m above the summit crater complex and drifting E. Based on the deformation and increased seismicity, CVGHM raised the Alert Level to 2 (on a scale of 1-4). From January through August 2009, the frequency of deep volcanic earthquakes averaged 85 events per month, but in August the number of events rose to 257 per month. During August-September, whitish plumes remained similar to September-October. In September seismicity fluctuated but tended to increase. Earthquakes and total tremors recorded at Kaba's monitoring post are shown in table 2. Table 2. Summary of Kaba seismic data recorded during 12 September-20 October 2009. Courtesy of CVGHM. 19 October 50. Max. amplitudes of 0.5-18 mm; S-P 0.5-2 s, and a duration of 2-15 s. 127. Max. amplitudes 0.5-15 mm, durations of 2.5-10 s. Volcanic tremor registered during 0640-0900 local time; max. amplitudes 0.5-2 mm. 20 October 29. Max. amplitudes of 0.5-18 mm; S-P 0.5-2 seconds and a duration of 2-15 s. 21. Max. amplitudes 0.5-15 mm, durations of 2.5-10 s. Continuous tremor with amplitudes of 1-7 mm; the most prevalent amplitudes 1-3 mm. During clear weather, whitish plumes rose ~ 25 m.
Deformation measurements taken using an EDM (electronic distance measurement) method were as follows: Biring station, shorter by 10 cm; Voelsang station, longer by 0.4 cm; and Kaba station, shorter by 2 cm. Measurements of the crater water temperature on 15 October showed a reading of 72°C, with a pH of 3.24. The sulfurous and associated solfatara areas recorded a temperature of around 106-107°C. There was no other activity in the area of the crater. On 20 October, CVGHM reported that seismic activity from Kaba increased in August and remained elevated in September and October. Inflation was also detected. When weather permitted, diffuse white plumes were seen rising 25-50 m above the crater rim and drifting E. Based on the deformation and increased seismicity, CVGHN raised the Alert Level to 2 (on a scale of 1-4). Some press reports indicated that increased activity from Kaba and neighboring Bukit Daun volcanoes preceded a destructive 17 December earthquake. Adjat Sudradjat and Suparto Siswowidjoyo report that no unusual volcanic activity took place. Thick white solfataric vapor was emitted from two craters (Kaba Lama and Kaba Besar) on Kaba, which last erupted in 1956. Temperatures of solfataras and a crater lake at Kaba were measured on several occasions in the past nine years (table 1). Active fumaroles are present on Bukit Daun, but the volcano has not erupted in historic time. Table 1. 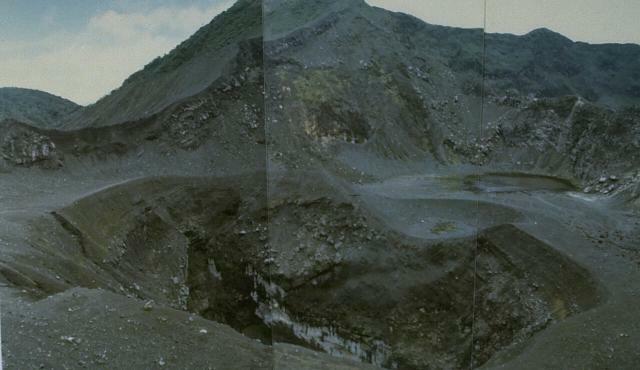 Temperatures of solfataras and a crater lake at Kaba, 1971, 1976, and 1978. Courtesy of VSI. Information Contacts: A. Sudradjat, VSI; Suparto S., Java and Sumatra Observatory, VSI. This report covers activity at Kaba documented by the Volcanological Survey of Indonesia (VSI) during August 2000. Deep volcanic earthquakes dominated seismicity during the second week of August. On 17 August seismographs recorded harmonic tremor with a maximum amplitude of 14 mm. Visual observations were hindered by clouds around the summit until the third week of the month. During 22-28 August, conditions were clear and a light gray ash plume rose 200 m above the summit. Five small explosion earthquakes were registered on 26-27 August, corresponding to the same number of observed ash emissions. By the end of August, the number of deep volcanic earthquakes decreased. Kaba remained at a hazard status of 2 (on a scale of 1-4) throughout the month. Kaba, a twin volcano with Mount Hitam, has an elongated summit crater complex dominated by three large historically active craters trending ENE from the summit to the upper NE flank. 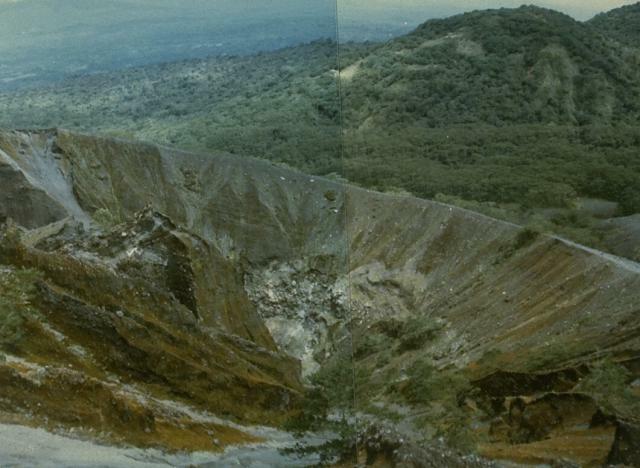 The SW-most crater of Gunung Kaba, named Hidup (or Lama), is the largest. Most historical eruptions have affected only the summit area. They mostly originated from the central summit craters, although the upper-NE flank crater Kawah Vogelsang also produced explosions during the 19th and 20th centuries. There is no Deformation History data available for Kaba. There is no Emissions History data available for Kaba. Steam rises from Kaba Kecil, the middle of three summit craters on Kaba volcano, viewed from the ENE at Vogelsang Peak on the upper NNE flank. The peaks Bukit Biring at the left and Bukit Kaba at the right flank Kaba Kecil crater. The far wall of Kaba Lama crater, the largest at Kaba volcano, forms the center horizon. Kaba is a low, elongated volcano with a summit containing three historically active craters that decrease in size towards the ENE. The central crater seen in this photo has been the source of most historical eruptions, although the two other craters, one of which is located on the upper ENE flank, have also been active. Small lakes have formed in all craters at various times. Fumaroles rise from the floor and margins of Kawah Besar, a small crater occupying Kaba Lama, the largest and westernmost of three major craters at the summit of Kaba volcano. A shallow lake occupies the floor of Kaba Besar. The rim of 1.2-km-wide Kaba Lama forms the horizon. An eruption from 1950 to 1951 formed a new crater, seen in the foreground, within the larger Kaba Vogelsang crater on the upper ENE flank of Kaba volcano. The eruption began in March 1950 and lasted until April of the following year. An ash eruption on March 7, 1951, destroyed forests on the volcano, and on March 26 incandescent bombs were ejected. Steam clouds pour from fumaroles occupying the floor of Kaba Lama, the largest of the three major summit craters of Kaba volcano. A shallow lake, one of several in the Kaba crater complex, occupies the crater floor. Gunung Kaba, rising above farmlands at Pematang Danau, has three large historically active craters trending ENE from the summit to the upper NE flank. The SW-most crater of Gunung Kaba is the largest. Most historical activity has consisted of explosive eruptions that affected only the summit region of the volcano. 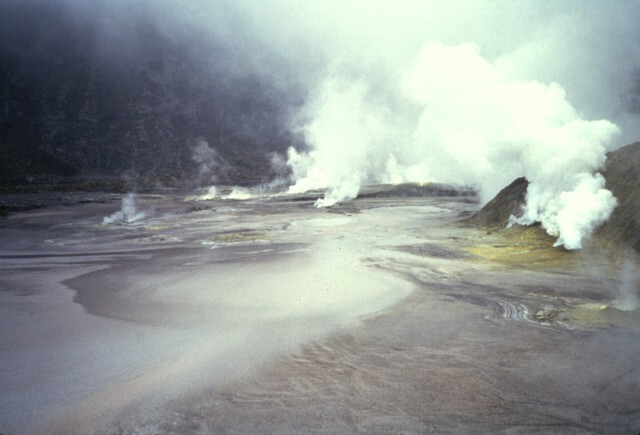 They originated from the central summit craters, although the upper-NE flank crater Kawah Vogelsang also produced explosions during the 19th and 20th centuries. 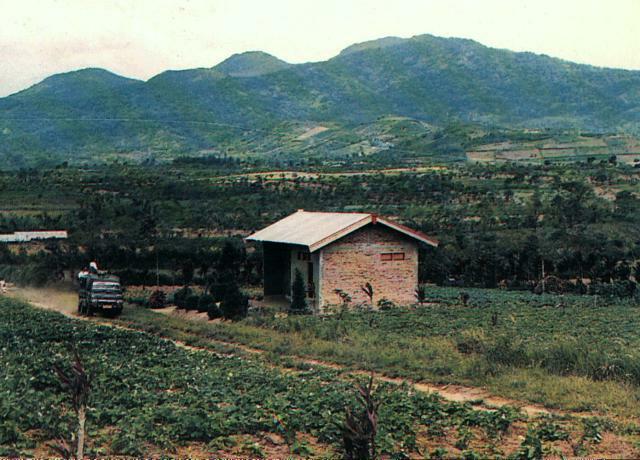 Photo by Setiadarma, 1989 (Volcanological Survey of Indonesia). There are no samples for Kaba in the Smithsonian's NMNH Department of Mineral Sciences Rock and Ore collection. Large Eruptions of Kaba Information about large Quaternary eruptions (VEI >= 4) is cataloged in the Large Magnitude Explosive Volcanic Eruptions (LaMEVE) database of the Volcano Global Risk Identification and Analysis Project (VOGRIPA).